Project: "This Land Over Time"
Description: This project aims to provide a glimpse of what has transpired in and around Commons Park and the South Platte River basin over millennia. 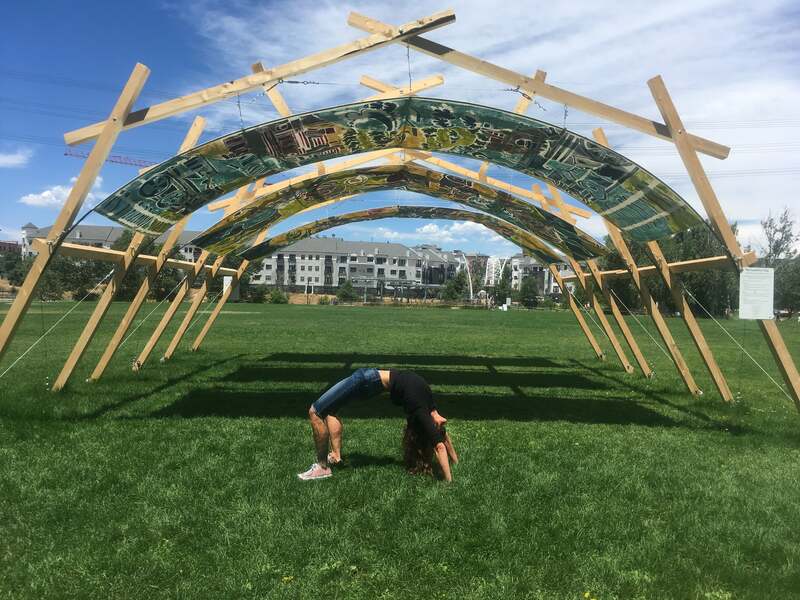 This site-specific installation consists of three archways (roughly 12 ‘x 16’ x 8’ each) built from Colorado pine beetle kill wood lined with hand painted panels depicting the transitions of many epochs. Visitors will be able to walk beneath the archways as they enter Commons Park, experiencing and learning about the rich history of this land. 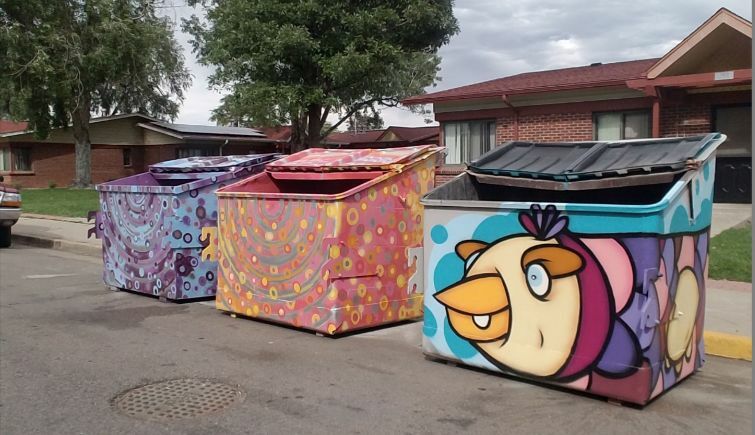 Description: Twenty artists will be enlisted to design and hand-paint unique creative artwork on 40 solid waste dumpsters in the Columbine Denver Housing Authority Development, including the dumpsters from Zuni to Tejon streets, and Alameda Avenue to Cedar Street. Artists will work in collaboration with the neighborhood association and the housing center’s residents to make this part of their “community cleanup” beautification project. Community participants will be encouraged to make these pieces of art their own and participate in creation. Description: Local artists will collaborate to install multiple creative L.E.D. light installations within the Broadway Corridor in the public right-of-way. These transportable installations will range in size, permanence and style, and will add beauty to the public spaces along Broadway, while also improving safety throughout the area by intentionally illuminating and animating underutilized areas. These light installations will be innovative and dynamic, providing both safety and beautification while honoring the history of Broadway’s forgotten theater row. These installations will create a long-term sense of place and identity. In the short-term these installations will become destinations, promoting health, happiness and well-being while stimulating local businesses and boosting the local economy. Sites: Various sites along Colfax Ave. Description: Bringing together the community along Denver’s Colfax corridor to create public art installations that raise awareness of traffic safety and Denver’s commitment to end traffic fatalities and serious injuries as a Vision Zero city. This artwork will support a dialogue among residents, city officials, advocacy groups and artists about our community values, and how we design our neighborhoods and streets to reflect those values. Community engagement will target neighborhood residents, business owners and patrons, and East High School students, as well as families of traffic victims. Community members will be invited to weigh in on the art project’s content and to assist with design and installation. Pat Milbery will draw upon this community input to design a large-scale mural that celebrates the accomplishments of Vision Zero and raises awareness of the progress that still needs to be made. Mr. Milbery will also work collaboratively with East High School students and community members to design smaller scale installations, such as sidewalk stencils or creative “street signs,” to be located in areas that community members identify as in need of safety improvements. 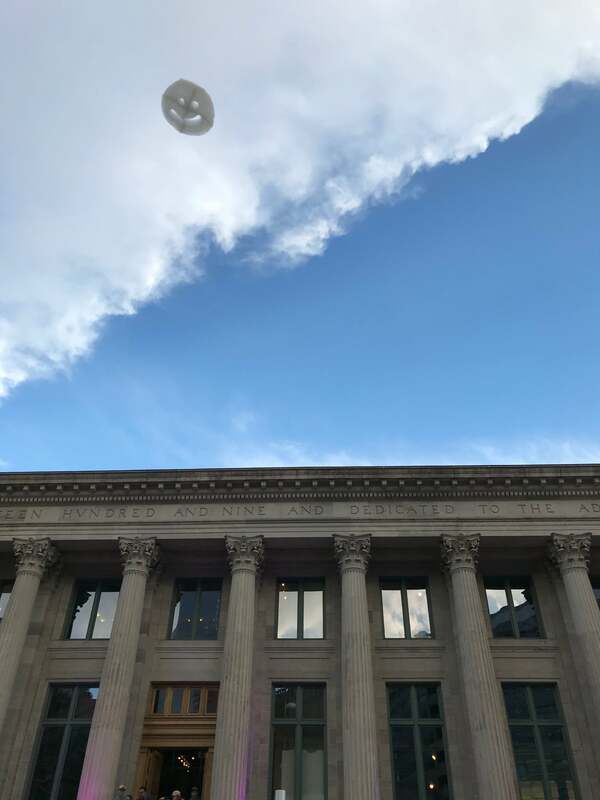 Description: It’s a bird, it’s a plane, it’s a giant happy face cloud? That is right; your eyes aren’t fooling you; those clouds are shaped like giant happy faces. Stuart Semple explains his motivation, ‘I just wanted to make a piece of work that would cheer people up a bit.’ he says, ‘I know at times like this it’s easy to make creativity a low priority but I want to show that on a very human level, an artistic idea might be able to do something important, even for a fleeting moment.’ The Happy Clouds are created using helium, soap and vegetable dye. Semple will release one Happy Cloud every seven seconds, and each cloud lasts approximately 60 minutes. More than 1,000 completely biodegradable clouds will be released in total. 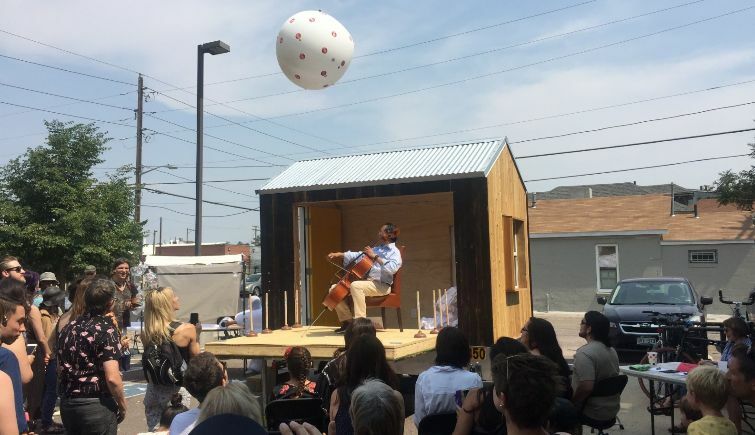 Description: As a collaboration between multiple entities, this project is intended to demonstrate the efficacy of tiny home villages as a more humane and holistic approach to the homelessness crisis in the city. RedLine proposes the construction of a model tiny home that can be used to demonstrate the aesthetics of a tiny home village and humanize its occupants. The model home would be well-designed and attractive, and participants in RedLine’s Reach Studio program would provide art for the interior. RedLine would help organize events that feature writing and art by individuals experiencing homelessness, and programming by homeless advocates. In addition, local cultural organizations and neighborhood groups will activate the model home to show how a village is an asset rather than something to be feared. The model home would allow curious residents to see for themselves what it would mean for a tiny home village to be a part of their neighborhood. Description: South Pearl Street Fairy Neighborhood is an interactive experience for all visitors to the Platt Park Neighborhood. This project designs and installs 3-5 artistic fairy doors in and around the South Pearl Street business district in public spaces such as alleys, entryways or parking lots. The South Pearl Street Corridor is a public gathering place with high visibility, and a good place to plant the seed of inspiration. 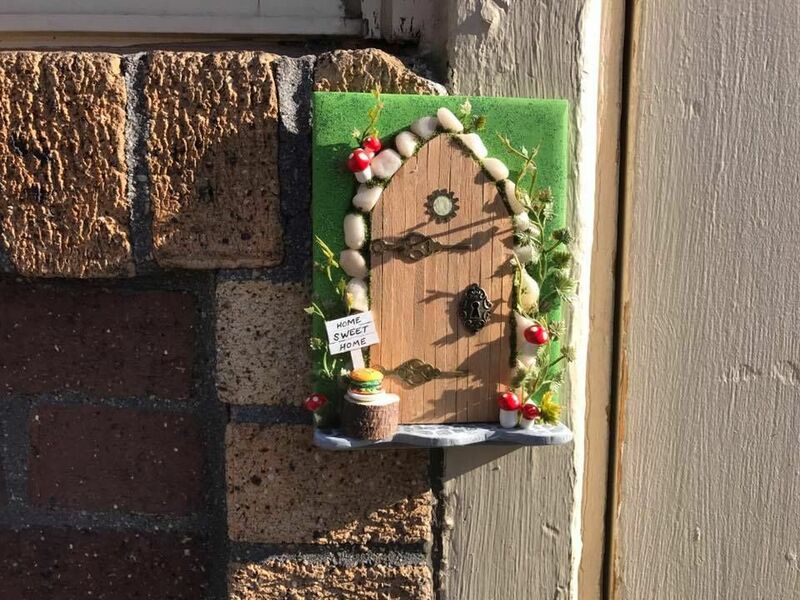 The initial doors created by three local artists will inspire other artists, families and residents to create and install their own doors, resulting in a neighborhood filled with fairy finding fun! This project also includes an interactive neighborhood map of the fairy doors, and an event to launch the project during which neighbors and visitors could learn from local artists about creating their own doors. Description: The handmade ceramic tile mural was designed by students in City Council District 4 and community artist/visual art teacher, Timothea Biermann, and painted by southeast Denver community members at the South by Southeast District 4 community festival on August 19, 2017. The mural will cover the retaining wall at the RTD Bus Stop (eastbound on East Hampden Ave. between South Holly and South Ivanhoe streets) which services Thomas Jefferson High School students and commuters along the Hampden corridor. 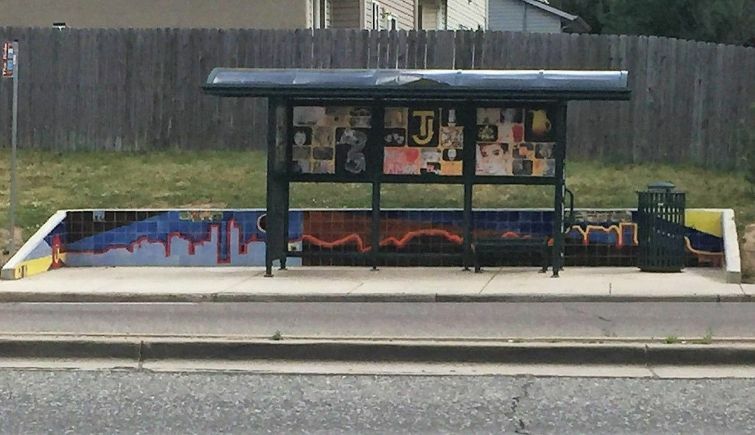 The ceramic tile mural installation will connect to the existing Thomas Jefferson Art Bus Shelter, creating an eye-catching and placemaking piece of public art on the very busy Hampden corridor.